PHOENIX -- A manhunt for multiple suspects was underway in the Phoenix area Wednesday after an Arizona Department of Public Safety officer was shot in the face during a traffic stop and responding officers got into a shootout, authorities said. The shooting occurred just before 3 a.m. in a Phoenix hotel parking lot as the officer approached a car he stopped for extremely dark tinted windows, officials said. The officer was shot in the face and wounded, but was able to radio for help, a law enforcement spokesman said. 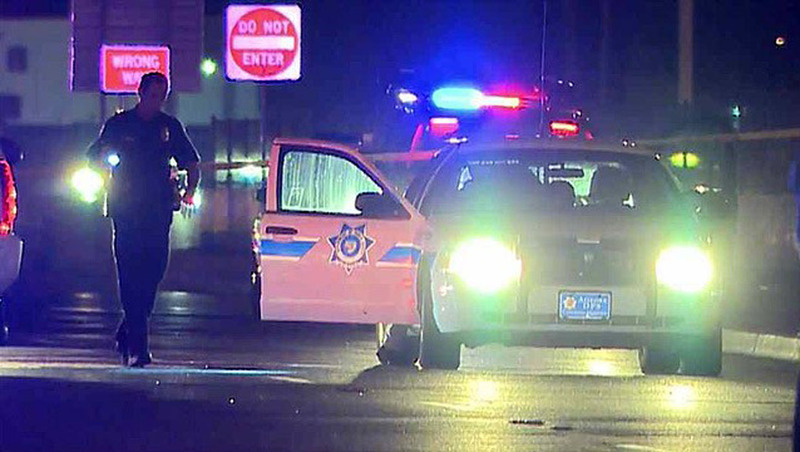 Two responding DPS officers were helping the officer in the parking lot of the Knight's Inn on Black Canyon Highway when the suspicious vehicle approached from behind and the suspects opened fire on the officers, Phoenix Police department spokesman James Holmes told CBS affiliate KPHO. The officers returned fire, and the vehicle left the area. Several hours later, Holmes said authorities had located the vehicle and were searching the vicinity. He declined to specify the location. Five suspects - believed to be young adults - were in the vehicle at the time of the shooting, reports KPHO. The wounded officer was in serious condition at Banner Good Samaritan Medical Center. His name was not released. DPS Officer Tim Case told the station the unidentified officer was in serious but stable condition while undergoing surgery. Case told the station the wounded officer is a six-year law enforcement veteran. Holmes said the discovery of the vehicle led authorities to cancel "blue alert" messages that were displayed on electronic signs on Phoenix-area freeways throughout the morning. It was the first time the Blue Alert system, intended to alert the public to assaults on officers, had been utilized in Arizona, KPHO reported. Holmes told the station the prognosis for the wounded officer appeared to be good. Authorities said the search for the five suspects - considered dangerous - is ongoing.